Our final prize giving ceremony took place last evening and it was an enjoyable, entertainment filled occasion for all concerned. The TY students treated us all to a sample of their work during the past year. Well done to the students and their teachers. Environmentally friendly versions of the shopping lists for books are available here for download. 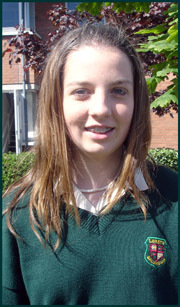 Transition Year Student of the Year 2007 - Orlagh Murphy. Junior students (first, second and third years) had their prize giving ceremony today. Congratulations to all students on their excellent behaviour during this busy awards ceremony and well done to all concerned. Junior Student of the Year 2007 - Eadaoin Copeland..
Senior students (fifth and sixth years) had their prize giving ceremony today. Congratulations to all students on their achievements. 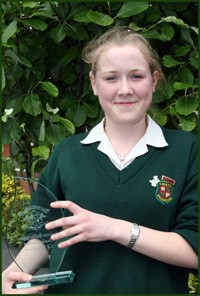 Senior Student of the Year 2007 - Emma Wilson. Best wishes to the U.18 and U.16 soccer team in the Leinster Finals on Friday, 18th. Well done to all the Transition Years involved in the excellent Fashion Show with Ms. Lennon. Congratulations to Lorna Sweetman (5th Year) who has been selected as an advisor to the ombudsman to children, Ms. Emily Logan. The Transition Year Fund Raising committee has organized a series of events during the week on behalf of the Marie Keating Foundation. They included a Candy Floss sale, a Ceol Loreto Gig with “21 Demands” and a Remembrance Event in the school garden. A school newsletter with up to date information has been forwarded to all students. An Art Exhibition will be held in the school on Friday, 18th May. Entitled “Self-ish”. These are self portraits inspired by contemporary art. The students and teachers worked in collaboration with I.M.M.A. and N.C.A.D. The 150th Anniversary Mass and refreshments in the school was a wonderful occasion giving many past pupils and staff the opportunity to meet again. A special donation was made to our new Loreto School in Rumbek, South Sudan. The U.13 soccer team lost in the Leinster Final to Eureka, Kells. Well done for reaching the final. Well done to the new Head Girl and Deputy Head Girls chosen this week. The Transition Years are busy rehearsing for next week’s Fashion Show. Best wishes to the U.16 Gaelic side who play in the Leinster final on Wednesday, 2nd May. Junior and Leaving Certificate Art practical examinations are ongoing in the week beginning 30th April. Best wishes to the students involved in the North Leinster Athletics Championships and the Loreto Athletics Championships. 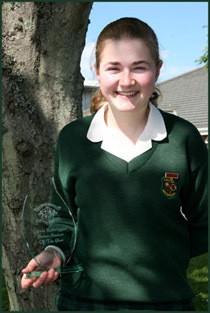 Well done to Alison Fynes who won the Senior Loreto Public Speaking Competition on Tuesday, 1st May. Tickets for the Transition Year Fashion Show are on sale at present. The school has continued its 150th celebrations this week with a tree planning ceremony in the school grounds. One tree was planted for each decade of the school’s existence. A commemorative stone with an inscription from Mary Ward was laid – “Love the truth and be doers of justice”. Tuesday the 8 th of May at 7.30pm in St. Peter and Paul’s church, Balbriggan. The sisters in the convent also had a variety of events to mark the occasion. Oral Irish and Russian took place this week for Leaving Certificate. French and German will take place next week. Practicals in Music and Home Economics are also on-going. Well done to the Senior Gaelic Football team who have reached a Leinster Final next weekend. Transition Year are rehearsing for our Fashion Show. Our Anti-Bullying Policy has recently been reviewed and can be read by following this link. The Transition Year musical, Cinderella, has been a great success.Well done to all concerned. The annual Charity/Social Awareness week with 5th & 2nd Years is ongoing. There have been awareness campaigns in addition to a wide variety of fund raising events. Monies collected will be forwarded to Temple Street and Loreto Rumbek in South Sudan. The 1st Year Public Speaking Finals will be held on Friday afternoon. Best wishes to all involved. On Friday, 26th the first event to commemorate our 150th Anniversary will be held – a party for all students. Orals, aurals and practicals will begin immediately after Easter for Junior & Leaving Certificate students. Well done to the Junior B Hockey team who won the Aine Dalton Trophy. Hard luck to the U-14 Soccer team who were defeated after extra time in the final yesterday. Wishing all connected with the school a happy Easter. Well done to the U-18 and U-16 Gaelic team who have reached the Dublin final. Well done also to the five school hockey teams in their matches this week. Three teams were involved in the Loreto Senior Mace Debating Competition. Congratulations to Stephanie Bollard and Jess Garvey on coming overall second. Congratulations to Caroline Walsh and Ciara Coyne who reached the second round of the Poetry Aloud Competition in the National Library on Thursday, 22nd March. The Transition Years are in final preparation for the school musical “Cinderella” which will be performed in the week beginning the 26th March. For more information on the play and some photo's from it, please click here. Next week is “Healthy Eating Week” in the school. A wide range of activities have been planned by the Student Council. A letter has been circulated to parents regarding the 4th Year PTM which takes place on Thursday, March 22nd, and it may be downloaded by clicking here. Please fill in and return the attached slip by Tuesday, March 20th. A 25th reunion of the class of 1982 will take place on Friday, April 27th, in the Blue Bar Skerries. Further information available from the school. If you know anyone from this year, please pass on this information. Transition Year Students had their annual retreat this week. First Year Basketball teams had mixed fortunes this week, with one victory and an narrow defeat. The school welcomed two junior teams from Stratford on Avon for two hockey friendlies. Balbriggan won both and made many new friends. A number of French related activities occurred on Thursday, 8th March. Many thanks to all supporters of our “Who wants to be a Thousandaire” which took place in the CityNorth Hotel on Wednesday, 7th March. Well done to the U-14 soccer team who defeated Alexandra College, 2 – 1 to reach the Leinster Final. Both goals were scored by Orla Haran. A riveting talk by a Holocaust survivor was given to 5th Years during the week. Hard luck to the Senior Basketball team defeated by Foxrock on Wednesday. Well done to both Gaelic and Hockey teams who has victories this week. T.Y. students visited Mountjoy on an educational visit during the week. A volleyball course for T.Y. students was also held on Friday, 3rd March. Best wishes to the students and teachers on the ski trip to Norway. There is a staff meeting on Tuesday, 27th February. Class ends for students at lunchtime. The Mock Examinations are now completed. Best wishes to all over the mid term. The Parents Association’s major fund raiser “Who wants to be a Thousandaire” takes place on March 7th. Tickets for the show are now available. Transition Year students are currently involved in a three week work experience placement. They will be visited by a teacher during their placement. Third & Sixth Year students are taking their mock examinations at present. Well done to the U.14 soccer team who reached the Leinster Semi Finals. Karima Bouzzah scored the two winning goals. All involved with the school were delighted to receive approval from the Minister of Education & Science to proceed to tender and construction in the next 12 – 15 months for our new extension. In brief this will mean an extra 30 classrooms (to replace temporary accommodation and rooms in Marian House), and a new state of the art Sports Hall. The Second Year Parent Teacher meeting takes place on Friday, 2nd February. The school has received the official go-ahead for Phase One of the Leaving Certificate Technology programme. Mock Interviews for Fifth Years finish this week. The athletic team participated in the cross country championships on Wednesday, 31st January. Our Gaelic team had a big victory against Loreto Foxrock and go on to the next round of their cup competition. There have been a number of hockey matches this week, home and away with varying results. Best wishes to all our Junior & Leaving Certificate students beginning their mock examinations. This has been Mary Ward Week in all Loreto Schools. 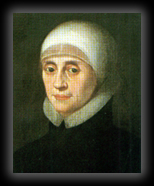 Our foundress has been commemorated in a wide variety of ways: Displays, talks, prayer awareness campaign. There have also been inspiring talks from Sr. Anne Farren, Principal in Loreto, Rumbek, our newest school, Sr. Kathleen McCelland focusing on Loreto throughout the world, Sr. Therese Larkin on the story of Mary Ward and her legacy today. Mock Interviews are ongoing for Fifth Years. Well done to all our hockey teams who participated in many matches this week. Best wishes to our Fourth Years who embark on their three weeks work experience placement. Each student will be visited by a teacher during their placement. The First & Second Year Talent Competition organized as part of the Gaisce Awards was won by Farah Elneihum. Well done to the organizing committee and all participants. Well done to the Junior Debating team who defeated Loreto Navan, today, Friday. 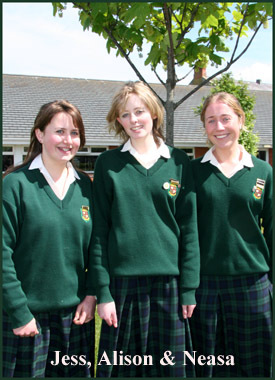 The team were Katie Sweetman, Aoife Duff, Niamh Harford and Kate O'Sullivan. Kate also was awarded the best speaker. Best wishes to the students participating in the Soroptimists Public Speaking Competition on 20th Jan. Emma Berry, Aoife Campbell, Katie O'Reilly and Niamh O'Connor-Barry. Fifth Year students had a talk on Women and Engineering on Thursday, 19th Jan.
Well done to the various hockey and basketball teams who participated in competitions this week. Transition Year students had a number of interesting visits/events this past week. They included a Film Studies Workshop, a talk from composer Gerry Murphy and a visit to Mountjoy. Mock Examination for Junior & Leaving Cert Students on Wednesday, 31st Jan. Launch of "Who wants to be a Thousandaire" in Man o War Pub on 13th February. "Who wants to be a Thousandaire" in the Bracken Court Hotel on Wednesday, 7th March. 150th Anniversary Evening on Thursday, May 3rd. Welcome back to the school community. Best wishes for the year ahead. The mock examination timetable is now available for download by clicking this link. Fourth and Fifth Years are receiving interview skills/work experience guidance this week. Best wishes to the Second Year Debating team who debate against Loreto, Swords, on Friday 12 th Jan.
5 th Year Parent/Teacher meeting takes place on Monday, 15 th January at 4.15 p.m.
Best wishes to the various hockey teams playing this week. First and Second Year Basketball players have a coaching day in the Naul Community Centre this week. A successful Ceol Loreto Gig took place on 13th Dec. The German students traditional Weinknachtsfest took place on Monday, 18th December. Adoration of the Blessed Sacrament took place all day in the Religion Room on Monday, 18th December. Circus Ceol have a morning’s follow up on their Circus trip on Monday, 18th Dec.
All Christmas examination results are now being processed in the office. Reports will be forwarded in early January. Please note that class will finish on Thursday, 9th January at 1.20 p.m. to allow staff plan for school development planning. Best wishes to all for Christmas and 2007. Congratulations to Ruth O' Toole for being selected to compete in the Junior Science Olympiad on the basis of her Junior Certificate Science result. Well done to the Senior Basketball team who defeated Loreto, Swords in a recent league match. A Christmas Newsletter will be forwarded to students in the week beginning the 11th December. Best wishes to the U.18 Soccer team in their match against Balbriggan Community College. The Parents Association are busy organising "Who wants to be a Thousandaire". If you can help with an advertisement at €150, please contact the school office. Funds are directed towards a proposed Astro Turf pitch. Best wishes to the four junior students participating in the Leinster Cross Country event on Wednesday, 6th. They are Sally Ann O'Brien, Camille Corbett, Eleanor Foley and Valerie Duignan. Relationships and Sexuality Talks continue for 5th Years in the week beginning 11th December. Best wishes to the school's senior choir performing as part of the Dublin Secondary Schoolgirls Choir in the Helix on Sunday, 10th December. Christmas Examinations and reports are in the process of being corrected and processed. They will be forwarded to parents/guardians in early January 2007. Well done to Lorna Sweetman and her 5th Year helpers in organising the fund raising breakfast morning for 2nd year. Monies went to Childline. Well done to the various sports teams involved in matches this weekend - Hockey, Soccer, Gaelic and Basketball. Ms. McFadden has organised training for the Student Council. this weekend. Fourth Years had a series of Relationships and Sexuality Talks this week. First Years had Anti-Bullying workshops presented by the Sticks and Stones group. An Irish T.Y. group also attended a Drama Workshop. Literary week and National Science Week have been outstanding successes. Congratulations to all involved. Transition Year Mini-Companies are up and running. Well done to those involved. Senior Art students visited I.M.M.A (Irish Museum of Modern Art) on Thursday, 16th March. A fund raising breakfast morning for children will be held on Monday 20th. Reminder to parents: The 3rd Year Parent/Teacher meeting will take place on Tuesday, 21st between 4.15 and 6.45 p.m. Apologies for the difficulties, in contacting the school by telephone. Congratulations to Ruth O'Toole who was selected to participate in the Junior Science Olympiads based on her Junior Certificate Science and Maths results. Well done to the following students who have left after their 2006 Leaving Certificate on winning Entrance Exhibition Prizes and Awards to both Trinity and U.C.D. A story teller from Poetry Ireland who will be telling stories to 1st Years. Marilyn Taylor will discuss writing and her acclaimed novel "Faraway Home". A trip to Kavanagh County.Public Speaking Competition. Students will be invited to dress as a character from their favourite book. School representation in both Junior & Senior Science Quizs in D.C.U. Well done to the U.16 Gaelic team who defeated drimnagh in a Dublin League match. Best wishes to the junior hockey team in their match against Mount Temple. The 6th Year Art class will visit Marino Casino and Castletown House as part of their Leaving Cert course. The week of Directed Prayer was felt by students and the teachers as very uplifting. The Ceol Loreto Gig takes place on Thursday, 26th Oct at 8 p.m.
Best wishes to the French Debating team competing the Alliance Francaise Debates on Friday, 20th October. A Ceol Loreto Gilg showcasing the talent of our students will take place in the School Hall on Thursday, 26th October at 8 p.m. The Fifth Year Retreat provided by 3 Rock took place in the Bracken Court Hotel. A school newsletter outlining the various events and issues will be given to students during the week of the 23rd October. Student Council elections have been completed. Well done to all who participated in the democratic process. A reminder that a staff meeting will take place on Wednesday, 25th October. Class finishes for students at 1.20 p.m.
Well done to Aisling Spillane (First Year) who was the Dublin U.12 Camogie Player of the Year. Well done to the U.16 Gaelic Team who had a significant win against St. Finan's. Best wishes to the 5th Year Students involved in the L & H Debating in U.C.D. : Stephanie Bollard, Alison Fynes, Neasa Forde, Jess Garvey and Ciara McConnell. Second Year Students have completed their Anti-Bullying workshops with the Sticks and Stones Group. Best wishes to the 147 students who are on an Adventure Week in Killary Adventure Centre. The consultative meeting on the Religious Education Policy was a great success. Staff, parents, diocesan representative, parents and Loreto personnel made for a most rewarding day. Six members of the Justice, Peace and Integrity of Creation Group are at the Loreto Justice and Peace Conference in Foxrock on the weekend of 13th - 14th October. Second Years had a most successful retreat/pilgrimage to Armagh in October.